The Gram-negative bacterium Gallibacterium anatis is a major cause of salpingitis and peritonitis in commercial egg-layers, leading to reduced egg production and increased mortality. Unfortunately, widespread multidrug resistance and antigenic diversity makes it difficult to control infections and novel prevention strategies are urgently needed. In this study, a pan-genomic reverse vaccinology (RV) approach was used to identify potential vaccine candidates. Firstly, the genomes of 10 selected Gallibacterium strains were analyzed and proteins selected on the following criteria; predicted surface-exposure or secretion, none or one transmembrane helix (TMH), and presence in six or more of the 10 genomes. In total, 42 proteins were selected. The genes encoding 27 of these proteins were successfully cloned in Escherichia coli and the proteins expressed and purified. To reduce the number of vaccine candidates for in vivo testing, each of the purified recombinant proteins was screened by ELISA for their ability to elicit a significant serological response with serum from chickens that had been infected with G. anatis. Additionally, an in silico prediction of the protective potential was carried out based on a protein property prediction method. Of the 27 proteins, two novel putative immunogens were identified; Gab_1309 and Gab_2312. Moreover, three previously characterized virulence factors; GtxA, FlfA and Gab_2156, were identified. Thus, by combining the pan-genomic RV approach with subsequent in vitro and in silico screening, we have narrowed down the pan-proteome of G. anatis to five vaccine candidates. Importantly, preliminary immunization trials indicated an in vivo protective potential of GtxA-N, FlfA and Gab_1309. Poultry meat and eggs are considered very important and sustainable sources of animal protein worldwide , making efficient strategies to prevent and control the spread of poultry diseases highly important . Gallibacterium anatis is a Gram-negative, non-motile, encapsulated coccobacillus of the Pasteurellaceae family , and commonly associated with poultry . Besides constituting a part of the normal microflora of the upper respiratory tract and lower genital tract in chickens , it is also considered a major cause of salpingitis and peritonitis in egg-laying chickens -. Thus, G. anatis infections lead to a drop in egg production and increased mortality in commercial layers . Unfortunately, widespread multiple-drug resistance  hinders treatment with traditional antimicrobial agents, while substantial antigenic diversity  among disease-causing field isolates hampers disease prevention by classical vaccination with inactivated whole cell bacterins. Hence, novel prevention strategies are urgently needed. The sequencing of the first bacterial genome in 1995  initiated the genomic era and catalyzed a shift from conventional culture-based approaches to genome-based vaccinology . This gave rise to the Reverse Vaccinology (RV) approach , in which bioinformatics tools are used to analyze genome sequences to identify genes encoding likely protective antigens. The concept of RV was initially applied to Neisseria meningitidis serogroup B (MenB) , for which conventional vaccine development approaches had failed in producing an efficacious vaccine. Based on the genomic sequence of MenB strain MC58 , five universal vaccine candidates were identified , and the resulting 4CMenB vaccine (Bexsero®) is now approved in the EU for active immunization of individuals aged over two months against disease caused by MenB . Since this pioneering MenB project, the RV approach has been applied to a variety of other important pathogens . However, the increased availability of multiple genomes for the same bacterial species has shown that genomic variability in bacteria is much more extensive than initially anticipated. Thus, analysis of the genome of a single strain often fails to address intra-species genetic variability and limits the effectiveness of genome-wide screens for vaccine candidates. To overcome this, a pan-genomic RV model utilizing the global gene repertoire for a species was proposed by Tettelin et al. . Pan-genomic RV was first applied to vaccine development in Group B Streptococcus, and this study demonstrated the importance of sequencing multiple strains of a single pathogen for the identification of vaccine antigens . The application of in silico and in vitro predictions has not only enabled a much more rational selection of vaccine candidates, but has also shown promise at reducing the number of experimental animals needed to verify the effectiveness of vaccine candidates. We report here the use of a pan-genomic RV approach for identification of novel and conserved immunogens of G. anatis. 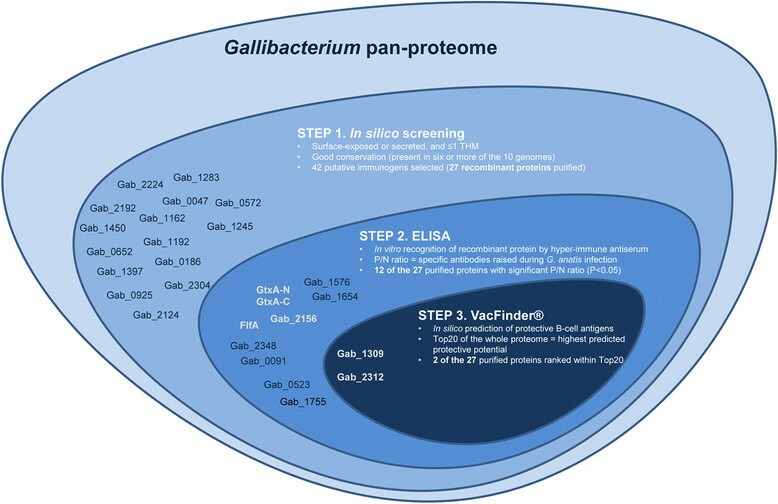 By implementing different in silico approaches and in vitro assays, we screened the Gallibacterium pan-proteome, resulting in a final selection of five proteins with a high predicted potential as vaccine candidates. Importantly, preliminary in vitro immunization results indicate protective potential of at least three of these candidates including FlfA, which has previously been tested and confirmed highly protective against homologous challenge in chickens . Together, these results provide an important step in the development of a new and broadly protective vaccine against G. anatis. All work on experimental animals was carried out with the approval of the Danish National Animal Ethics Committee (Approval no. 2012-15-2934-00339 and 2012-15-2934-00923). The 10 Gallibacterium strains included in the study are listed in Table 1. The strains were selected based on their pathogenic potential, prevalence in the field and genetic diversity, in order to provide as much diversity as possible within the species. Bacteria were incubated at 37 °C on brain heart infusion (BHI) agar supplemented with 5% citrated bovine blood in a closed plastic bag or in BHI broth with aeration. aCz: Czech Republic, DK: Denmark, G: Germany, MX: Mexico. Sequencing and assembly of G. anatis strains 12656–12 and F149T was performed as described previously . The remaining genomes were sequenced using the Illumina Genome Analyzer IIx (CD genomics, New York, USA). Reads were assembled using VelvetOptimiser 2.0 . All 10 genomes were annotated using Prokka v.1.0 . The subcellular localization of the 31 564 annotated proteins from the 10 genomes was predicted using standalone PSORTb v.3.0 . The presence of N-terminal signal peptides was predicted using SignalP v.3.0  and the number of transmembrane helices (TMHs) was predicted by TMHMM v.2.0 . The protein conservation among the strains was analyzed using BLASTp v.2.2.22  with default parameters. The theoretical molecular masses and isoelectric points were calculated using the pepstats tool in EMBOSS . In total, 42 proteins were selected (Table 2). aPreviously described as GtxA in . bPreviously described in . Gab_1164 = FlfA. cPreviously described as OmpC in . Each of the selected genes was amplified from the G. anatis 12656–12 genome by PCR and cloned into the Gateway entry vector pENTR™/SD/D-TOPO (Invitrogen). Primers were designed using Oligo Explorer 1.2 (Gene Link™, Hawthorne, NY, USA) as described previously . Areas with high predicted hydrophobicity in the N and/or C terminus were removed, as were predicted signal peptides. In addition, GtxA was cloned as two parts (N- and C-terminal) due to its size. The E. coli strains and plasmids used in this study are listed in Additional file 1. Genes were cloned and small-scale expressed as described in Additional file 2 using Gateway cloning and ligation-independent cloning (LIC) systems. Altogether, 37 expression clones were constructed for 36 of the 42 selected proteins (two clones were made for GtxA). The primer sequences used for gene amplification, and the final expression vector chosen for protein expression from each gene, are listed in Additional file 3. All proteins were expressed and purified in large-scale from E. coli Rosetta 2 (DE3) cells (Novagen, Madison, WI, USA). Large-scale expression was performed in a custom-made large-scale expression system (LEX) (Harbinger Biotech, Toronto, Canada) as described previously  and in Additional file 2. Of the 37 expression clones, 27 recombinant proteins were successfully purified; the majority (17) of these proteins had a purity > 90%. Two Lohmann brown chickens (21 weeks old) were purchased from a commercial breeder with high biosecurity standards. The chickens were kept under free indoor housing conditions and were provided with fresh water and feed ad libitum. The chickens were swabbed for the presence of G. anatis by a cloacal swab. After two weeks of acclimatization the chickens were challenged with 105 colony forming units (CFU) of G. anatis 12656–12 by injection into the peritoneal cavity as previously described  and re-infected 2 weeks after the first infection. Blood for serum purification was collected from the brachial vein prior to the first infection (pre-immune antiserum) and one week after the second infection (hyper-immune antiserum). The putative immunogenicity of each of the purified recombinant proteins was assessed by indirect ELISA as described previously , using pooled anti-G. anatis pre-immune and hyper-immune antiserum. Briefly, Nunc-Immuno™ MicroWell™ 96-Well Plates (Thermo Scientific, Waltham, MA, USA) were coated overnight at 4 °C with 0.5 μg recombinant protein (48 wells per protein) diluted in carbonate-bicarbonate buffer (pH 9.6) (Sigma-Aldrich, St. Louis, MO, USA). Each well was then washed; this and all subsequent washing steps consisted of three washes in 350 μL wash buffer (PBS + 0.05% Tween 20). The wells were blocked for 2 h at room temperature in 200 μL blocking solution (PBS containing 0.05% Tween 20 and 2% bovine serum albumin (BSA)) and washed. The antibody titers were assayed by serial 3-fold dilutions of chicken serum ranging from 1:200 to 1:48600. All dilutions were prepared in triplicate in dilution buffer (PBS containing 0.05% Tween 20 and 0.1% BSA), 100 μL were added to each well and plates were incubated for 1 h at 37 °C. For each assay, 12 control wells were included, which contained pure dilution buffer; secondary antibody was added to 6 of these wells as a measure of background, and the other 6 wells remained blank as a negative control for the ELISA. Following incubation, the wells were washed and 100 μL polyclonal goat anti-chicken IgG (Fc):HRP (AbD Serotec, Puchheim, Germany), diluted 1:4000 in diluting buffer, were added to each well and the plates incubated for a further 1 h at 37 °C and then washed. To detect the binding, 100 μL of 3,3′,5,5′-Tetramethylbenzidine (TMB) liquid substrate (Sigma) were added to each well. The plates were incubated for 2 min and then the reaction was stopped by addition of 100 μL 1 M HCl. The absorbance was read immediately at 450 nm in a PowerWave XS spectrophotometry (BioTek Instruments, Winooski, VT, USA). The antibody titers were calculated for the measured absorbances at 450 nm , using the “Antibody Titers” online data analysis tool . To compare and rank the ELISA results, a P/N ratio (P = hyper-immune serum, N = pre-immune serum) of mean antibody titers was calculated . All statistical analysis was performed using SAS version 9.3 (SAS Institute, Cary, NC, USA), and differences between groups assessed using a one-way t-test. The recognition of recombinant protein by hyper-immune serum was deemed significant at P < 0.05, indicating that the protein was expressed in vivo during G. anatis infection and elicited a specific immune response. To further predict the protective potential of each of the expressed proteins, each of the proteins was analyzed using the proprietary VacFinder® in silico technology platform (Evaxion Biotech, LLC, USA). VacFinder® is a data-driven machine learning method trained by protein property pattern recognition on known and protective B-cell protein antigens (except for exotoxins), aiming at identifying novel and protective B-cell protein antigens with a neutralizing opsonizing profile. The machine-learned prediction is based on specific protein property features of protein sequences rather than sequence similarity, allowing antigen classification based solely on protein properties . The output is a list of proteins from the proteome ranked by their ability to elicit a highly protective antibody response. 24 Isa Brown layer chickens (16 weeks old) were purchased from a commercial breeder with high biosecurity standards. The chickens were swabbed for the presence of G. anatis by a cloacal swab. The chickens were randomly divided in eight groups of four each and allowed to acclimatize for one week after arrival. The chickens were kept under free indoor housing conditions and provided with fresh water and feed ad libitum. Each group was immunized subcutaneously with 100 μg of one of the five selected recombinant proteins (GtxA-N, FlfA, Gab_1309, Gab_2156 or Gab_2312) mixed in 0.5 mL of SEC buffer (50 mM NaP, 150 mM NaCl, 0.5 mM TCEP, 10% glycerol; pH 7.5) and 0.5 mL of Freund’s incomplete adjuvant (Sigma-Aldrich). As a control (non-immunized), a group of four chickens was immunized with a placebo (SEC buffer and Freund’s incomplete adjuvant). Two weeks after the immunization all chickens were infected intraperitoneally with 1.5 × 106 CFU of G. anatis 12656–12 as described previously . Forty-eight hours after infection the chickens were euthanized and a post mortem examination was conducted. To assess the protective effect of the immunization, the lesions found in peritoneum of each bird were scored according to three parameters: (i) inflammatory reaction, (ii) amount of exudate, and (iii) clarity of the peritoneal surfaces. All parameters were scored on a scale from 0–3, thus giving a maximum score of 9. Furthermore, the presence of Gallibacterium was detected by swabbing the peritoneum with a sterile cotton swab and streaking it onto BHI blood agar. The scorings of the lesions in the peritoneum were analyzed by a Mann Whitney U test and P < 0.05 were deemed significant. Multiple amino acid sequence alignments of the Gab_1309 and Gab_2312 proteins and their orthologs were prepared using MAFFT v7.130b  and formatted using Jalview 2.8.0b1 . The genome sequence of G. anatis 12656–12 has recently been made available  and was submitted to Genbank (BioProject ID: 213810, accession number AVOX00000000). The nucleotide sequence accession numbers for the genes included in this study are listed in Table 2. Genome sequence reads from the nine Gallibacterium strains used for Gab 1309 and Gab_2312 multiple sequence alignment were submitted to the NCBI Sequence Read Archive (SRA)  and can be retrieved using the study accession number SRP029613. For the identification and selection of putative immunogens, the genomes of 10 Gallibacterium strains were analyzed (Table 1). Based on the central premise that protective antigens should be accessible to the host immune system, proteins predicted to be surface-exposed or secreted were selected from the G. anatis pan-proteome. Moreover, proteins with more than one TMH were discarded, based on the premise that they are unlikely to be transported beyond the inner membrane. In addition, these proteins have the highest rate of expression failure during subsequent procedures  or are less likely to be over-expressed in E. coli. Finally, proteins present in six or more of the 10 G. anatis genomes were identified. A protein was considered present if a significant full length match (E-value < 10−8) was obtained. From a total of 31564 proteins, 162 proteins were predicted as extracellular proteins and 482 proteins as outer membrane proteins. Of these, 42 proteins were present in six or more of the 10 genomes and these proteins were selected for further studies (Table 2). Each of the 42 selected genes was amplified from the G. anatis strain 12656–12 genome by PCR. This strain was chosen for gene cloning as it is a well-characterized and highly pathogenic strain originally isolated from the liver of a chicken with septicaemia ,. Using different high-throughput cloning strategies, 37 proteins were successfully purified at a small-scale from E. coli and of these, 27 were successfully purified in the large-scale trials (Table 3). The 10 remaining proteins were lost during the large-scale purification process due to low yield, impurities or lack of expression in E. coli in large-scale cultures. aRatio between the mean antibody titer values (P = hyper-immune serum; N = pre-immune serum). Asterisks indicate statistically significant difference between the two groups (* = P < 0.05, *** P < 0.001). bProteins ranked within the Top20 of the G. anatis 12656–12 proteome by VacFinder®. cPreviously described in . Due to the size of the protein it was cloned, expressed and purified as two halves. In order to reduce the number of antigens to be tested in vaccine trials, the immunogenic potential of the 27 purified proteins was assessed in vitro by an indirect ELISA approach using pools of anti-G. anatis 12656–12 pre-immune and hyper-immune antiserum from two chickens. The chickens were, as expected, found to be positive for G. anatis on the cloacal mucosa prior to the immunizations. The mean antibody titers were calculated for each protein using both pre-immune and hyper-immune antiserum. To rank the proteins, P/N values between the two antibody titers were calculated for each protein (Table 3). A significant and specific reaction with hyper-immune antiserum was identified for 12 of the 27 recombinant proteins tested (Figure 1), namely GtxA (both halves of the protein), FlfA, Gab_0091, Gab_0523, Gab_1309, Gab_1575, Gab_1654, Gab_1755, Gab_2156, Gab_2312 and Gab_2348. These results indicate (i) that these 12 proteins are expressed in vivo by G. anatis 12656–12, (ii) that the proteins are recognized by the chicken immune system, and (iii) that the proteins elicit a specific antibody response. The remaining proteins were not significantly recognized by the hyper-immune antiserum. Antibody titers of immune serum against recombinant proteins. Mean calculated antibody titers ± SEM are shown for each protein based on the ELISA performed on sera collected before (pre-immune) and after (hyper-immune) infection with G. anatis strain 126565–12. The titers were calculated using the measured absorbances at 450 nm as described in the text. Differences in mean antibody titers between pre-immune and immune ELISA responses were analyzed using one-way ANOVA with a t test. Asterisks indicate statistical significance (*P < 0.05, ***P < 0.001). To provide an additional prediction of the protective potential of the 27 proteins available in recombinant form, the protein sequences were analyzed in silico with the VacFinder® algorithm. The entire G. anatis strain 12656–12 proteome (approximately 2500 proteins) was analyzed and ranked for protective potential. Proteins ranked in the Top20 are those predicted to have the highest protective potential (Table 3). Of the 27 proteins cloned and expressed in E. coli, only Gab_1309 and Gab_2312 were ranked within the Top20 VacFinder® hits. Two of the 27 proteins, Gab_1309 and Gab_2312, elicited a significant ELISA response and were ranked in the Top20 proteins with protective potential in the G. anatis 12656– 12 proteome as determined by VacFinder®, suggesting that these proteins should be prioritized in further analyses. Both proteins were expressed in E. coli with an N-terminus His6-tag and purified in soluble form. Due to the high degree of predicted hydrophobicity within the C-terminal region of Gab_2312, as well as the size of the whole protein (325.7 kDa), only a small part (338 residues) was included in the final recombinant protein. Homologs of Gab_1309 and Gab_2312 were identified within the genomes of all the 10 strains included in this study, as well as in the recently sequenced G. anatis strain UMN179 (UMN_1211 and UMN_1565) , further supporting their potential as broadly protective immunogens. To determine the level of protein sequence conservation of Gab_1309 and Gab_2312, multiple alignments were conducted against the protein homologs from other G. anatis strains. The Gab_1309 protein sequences were almost identical across all strains (Additional file 4). On the other hand, the Gab_2312 protein sequences varied considerably in length from 2157 residues in G. anatis strain F149 to 5202 residues in G. genomospecies 2 strain CCM5976. Despite this difference, several well-conserved sections could be identified within the sequences, indicating a degree of conservation within the structure and the presence of common epitopes. Additional file 5 shows the alignment between the 338 residues included in the recombinant protein and the corresponding parts in the protein homologs. To evaluate the protective potential in vivo of the five most promising vaccine candidates (GtxA-N, FlfA, Gab_1309, Gab_2156, or Gab_2312), groups of four chickens were each immunized with one of the recombinant proteins, followed by intraperitoneal challenge with G. anatis 12656–12. G. anatis was recovered in pure culture from chickens within all the immunized groups, as well as from the non-immunized group. However, two chickens from the group immunized with GtxA-N and one chicken from the group immunized with FlfA were culture-negative. A significant lower lesion score was found in the group immunized with GtxA-N (P = 0.02), FlfA (P = 0.04) and Gab_1309 (P = 0.02) when compared to the non-immunized group (Figure 2), indicating a protective potential of these three proteins. The two groups immunized with Gab_2156 or Gab_2312 did not show a significant difference when compared with the non-immunized group. Immunization of chickens with recombinant proteins. Chickens were immunized once with 100 μg recombinant protein (GtxA-N, FlfA, Gab_1309, Gab_2156, or Gab_2312) or a placebo (non-immunized), followed by intraperitoneal challenge with G. anatis 12656–12. The scoring of the lesions found in the peritoneum was done according to three parameters: (i) inflammatory reaction, (ii) amount of exudate, and (iii) clarity of the peritoneal surfaces. All parameters were scored on a scale from 0–3, thus giving a maximum score of 9. The horizontal lines shows the group median, and the difference between the lesions scores of immunized and non-immunized groups was analyzed using Mann Whitney U test. Asterisks indicate statistical significance (*P < 0.05). Novel prevention and treatment strategies are urgently needed to prevent G. anatis infections in the reproductive tract of chickens. In this study, a pan-genomic RV approach , was applied to identify novel and potentially broadly protective immunogens from G. anatis. The screening procedures and the main results are summarized in Figure 3. Of the 42 in silico predicted immunogens (Table 2), 27 proteins were successfully expressed in E. coli (Table 1), and of these, two novel proteins, Gab_1309 and Gab_2312, elicited a significant ELISA response and were also ranked in the Top20 of the G. anatis 12656– 12 proteome by VacFinder®. Furthermore, these two proteins were present in all 10 strains included in this study as well as in the recently sequenced genome from G. anatis strain UMN179 . Identification and selection of immunogens from Gallibacterium. Summary of the three screening procedures used to identify and select putative immunogens from the Gallibacterium proteome. The 27 proteins successfully cloned, expressed and purified are listed and placed based on the screening results. Future investigations should focus on the proteins marked in white. Gab_1309 is a predicted lipoprotein, and this annotation is supported by the DOLOP database . The protein sequence of Gab_1309 shows sequence similarity to the NlpD lipoprotein from Yersinia pestis. By use of the Conserved Domain Database (CDD) feature in BLASTp , an N-terminal LysM domain and a C-terminal M23 peptidase domain can be identified in Gab_1309. The LysM domain is widespread among several bacterial species and is involved in peptidoglycan-binding and bacterial cell wall degradation ,, while the M23 family of endopeptidases is thought to be involved in bacterial cell wall separation . Further studies are warranted to determine the specific function and role of Gab_1309 in G. anatis pathogenesis. The C-terminal section of the second promising novel vaccine candidate identified in this study, Gab_2312, demonstrated 34% sequence similarity (conserved or identical residues) to the 200 kDa extracellular matrix protein adhesin A (EmaA) from Aggregatibacter actinomycetemcomitans. EmaA is widespread among A. actinomycetemcomitans strains  and belongs to the family of trimeric autotransporter adhesins (TAAs) . TAAs are a group of homotrimeric virulence-related proteins in Gram-negative bacteria that primarily act as adhesins . Interestingly, the Neisseria adhesin A (NadA) protein from MenB, which is one of the proteins in the recently approved 4CMenB vaccine (Bexsero®), also belongs to this family of TAAs , further suggesting a protective potential of Gab_2312. The prediction of Gab_2312 as a TAA protein was further confirmed using the recently developed domain annotation workflow of TAAs (daTAAs) . Although Gab_1309 and Gab_2312 were the only proteins identified by both the ELISA screening and the in silico VacFinder® analysis, a number of proteins elicited a significant response as measured by ELISA, indicating that these proteins are expressed and immunogenic during G. anatis infection. It is currently unclear whether proteins that do not stimulate a natural immune response should be included as vaccine candidates. As our intraperitoneal immunization procedure bypassed the mucosal surface of e.g. the salpinx, this may not have induced a broad based natural immunological response, which in turn could explain why some proteins failed to induce a significant antibody response. However, studies have shown that high antigenicity of a protein does not necessarily lead to protection , questioning the validity of the antigen-specific titer as a marker of the overall ability to stimulate a protective immune response in vivo . On the other hand, serological titers have been demonstrated to provide useful information about the reactivity of certain antigens to antibodies and thereby give indications about their potential as vaccine candidates . In support of the ELISA antigen screening approach, three of the 10 proteins identified by the ELISA screening; GtxA, FlfA and Gab_2156, have recently been demonstrated as important, well-conserved G. anatis virulence-factors. GtxA is a large, cytolytic RTX toxin responsible for both the haemolytic and leukotoxic activity of G. anatis,, while FlfA and Gab_2156 are both subunits of F17-like fimbriae . To this, FlfA has been suggested to play a role in the tissue tropism of G. anatis by promoting adhesion to the epithelial lining in the reproductive tract and beyond during the typical course of disease . The identification of GtxA, FlfA and Gab_2156 by ELISA further supports the predictive potential and importance of this screening approach, where particularly the N-terminal part of the GtxA-N elicited an extremely high antibody response in comparison to the remaining 26 proteins investigated (Figure 1 and Table 3), thereby suggesting that this part of the protein is particularly promising as a vaccine candidate. This suggestion is supported by a previous study by , demonstrating the protective potential of the N-terminal portion of the RTX protein, ApxI, against infections caused by Actinobacillus pleuropneumoniae. The use of hyper-immune antiserum to screen for antigenic potential has previously been used successfully to identify putative immunogens from Bacillus anthracis, and in that study, the control sera (pre-immune antiserum) consisted of a mixture of naïve animal sera . In our study, the pre-immune antiserum and hyper-immune serum was obtained from the same chickens before and after G. anatis 12656–12 infection. However, the chickens were found to be positive for G. anatis in the trachea and cloaca prior to infection. Since G. anatis is a typical part of the microflora in these organ systems , we find that this reflects the natural in vivo condition, which allows us to identify those proteins significantly expressed and exposed to the chicken immune system during infection. Thus, the ELISA screening applied in this study can be considered a semi-in vivo-evaluation and an important screening assay to evaluate antigenic potentials of recombinant proteins. Of the 27 proteins tested by ELISA, 15 were not recognized by hyper-immune antiserum. However, these proteins might still possess immunogenic potential, as it is well-established that in vitro assessments may miss some proteins . Moreover, a recent study focused interest on non-immunodominant protein regions for vaccine development and suggested the importance of analyzing major surface-exposed proteins for the presence of sub-regions that elicit protective immunity as a complement to the RV approach . Additionally, the insolubility of many of the proteins tested by ELISA might also lead to false-negative titer-values, as it has been shown that linear epitopes are less likely to be immunodominant and elicit a good B-cell response if the protein possesses a higher-order structure . On the other hand, the folding of a recombinant protein is not necessarily equivalent to the native structure of the protein, and moreover, folded recombinant proteins might expose epitopes normally hidden , and thereby lead to a false-positive ELISA response. To provide an additional prediction of the protective potential, the sequences of 27 proteins were ranked within the G. anatis 12656–12 proteome by use of the in silico VacFinder® platform, in order to add an extra selective criterion. The ranking by VacFinder® is based on the predicted ability of a protein to elicit a high protective antibody response. Thus, the identified proteins are not affected by possible solubility problems or competing immunodominant epitopes. Moreover, VacFinder® does not consider general practicalities of cloning, expression and purification. The combination of VacFinder® prediction and ELISA screening identified two proteins, namely the above-mentioned Gab_1309 and Gab_2312. However, the previously identified and well-conserved virulence factors, GtxA, FlfA and Gab_2156, were not predicted as highly protective by VacFinder®. Leaving out GtxA, which is an exotoxin and not possible for VacFinder® to predict, FlfA and Gab_2156 were respectively ranked #58 and #41 out of the whole proteome. Hence, the Top20 of the proteome by VacFinder® is predicted to elicit the highest protective antibody response, yet this study demonstrates that proteins with a lower predicted protectiveness can be highly immunogenic. 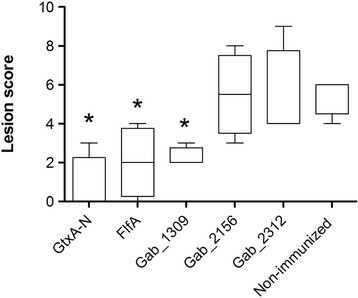 Finally, the protective potential of the five most promising vaccine candidates; GtxA-N, FlfA, Gab_1309, Gab_2156 and Gab_2312, was evaluated in vivo. The results from these preliminary in vivo immunization trials indicated that at least GtxA-N, FlfA and Gab_1309 are promising vaccine candidates with a good protective potential. These results correspond well with previous results demonstrating the in vivo protective potential of FlfA . Further studies, including larger group sizes, different doses and repeated immunization, are needed to confirm the protective potential of the recombinant proteins. Moreover, the ability of the recombinant proteins to elicit a broadly cross-protective immune response against heterologous strains should also be investigated. Still, the results presented in this paper provide an important step towards the development of a new and broadly protective G. anatis vaccine. This work was supported by the Danish Research Council for Technology and Production, grant 09–065909, and a PhD stipend from the Faculty of Life Sciences, Copenhagen University. The authors acknowledge the excellent technical assistance of Kate Rainczuk, for her help with the Gateway cloning, and Sara Bjørn, for her help with the LIC cloning. RJB contributed to the design of the study, carried out the experiments and drafted the manuscript. EK and TS carried out the genome assembly, annotation and submission to Genbank. IP prepared the pan-proteome and carried out the in silico selection of the putative immunogens. JB and BA participated in the small-scale cloning and expression of the recombinant proteins. TKN participated in the large-scale expression and purification of the recombinant proteins. SEP carried out the in vivo experiments. AHM carried out the VacFinder predictions. AMB conceived the study, participated in its design and its coordination, and helped to draft the manuscript. All authors read and approved the final manuscript.